Eleven year old singing sensation Nic Neufeld rocks the house for Southern Alberta Flood Relief. When the massive floods hit communities to the south of us such as Calgary and High River several weeks back a group of local ladies could not just sit idly by and not try to help. Hence, Cindy Guy, Cindy Carstairs, Lisa Seal, Candice Marshall, and Jolyne De Marco, with the help of Andrea Martinuk, Manager for the Maclab Theatre, all put their heads and talents together and ta-da, the Southern Alberta Flood Relief Concert at the Maclab Theatre was born! Put together within an astounding two weeks, these ladies worked virtual miracles by partnering with Edmonton's Pure Artists to gather six up and coming young singers who volunteered their time to put on a stellar show and raise funds to help ease our southern neighbour's suffering. The evening was hosted by Leduc FM's one and only Mike McGuire, who alternately teased, abused, and kidded the audience throughout the night, keeping them chuckling and entertained between each act. Everyone had a laugh at one point as Mike confessed that he was contributing to the cause by fully enjoying the bake sale table out in the lobby and then chowed down on a homemade eatmore cookie bar that he whipped out of his jacket pocket while onstage. The silent auction was heavily supported by several local businesses including Leduc Car & Truck Wash which donated several hundred dollars worth of gift certificates, the Funky Fro, and Har-De Agri Services who donated hundreds of dollars worth of lawn care maintenance packages. The first artist to take to the stage that evening was Rachel Waznow. This 17 year old has an incredibly powerful voice that she showcased to its fullest this evening. Rachel was the winner of the 2011 YTV Virtual Next Star competition and has just released her first single titled "American Boy" on iTunes. She performed this catchy song at the benefit this night. 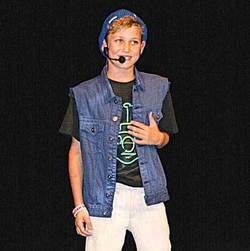 Eleven year old Nic Neufeld had the audience in the palm of his hand from the moment he stepped on stage with his adorable good looks, big personality, and promising singing voice. He is completely reminiscent of a younger Justin Beiber. This talented young man is actually starting a six week tour of the U.S. in August. Country Queen Candice Ryan nailed her songs to the wall with her fabulous voice and strong country vibe. Placing in the top 10 finishers of the recently completed Nashville North competition it's not hard to imagine this young woman strutting across stadium stages in the near future, especially since her first single "Cougar Blonde" is already getting radio airplay. Candice has recently put out her first CD which was available for sale at the Maclab that evening. She made a surprise announcement during her set that she would be donating 1/2 of all the sales proceeds from that night to the cause. Then, just to show that she is not simply one dimensional in her musical talents, she chose as her final song David Guetta's Titanium, in which she managed to insert a touch of her own personality but was still pitch perfect and strong on every note. After the intermission artists Emily Seal, Brendan Guy, and Michelle Molineux had the crowd clapping and swaying for the rest of the night, with Molineux even bringing along two back up dancers to end the night on a high note. All the talent in the house that night was not just on stage either, as the audience was stacked with several well known local personalities. Jenn Dalen and Andy Captain from The One FM were all ears paying rapt attention to each performer, as well as Jake Ryan from 92.5 Fresh FM, Carol-Lynn Quinn, lead singer from the band Rend, and Dan Davidson from the band Tupelo Honey were all present and accounted for. In spite of a rather low audience turn out the evening was overall a big success, raising $3,156.60 which will all be donated to the Alberta Red Cross and tagged specifically for flood relief in Southern Alberta.